- Debbie dobbing Michael in to the police. Beth, Lauren, Lou and Cameron are eating. They chat about Lauren's entrance onto the street and Cameron is admiring of the way Lauren regained control of her horse. Lou says that he's had to apologise to all of the neighbours! Lauren says she appreciates him doing so. Beth says that Lauren should've saved her arrival for tomorrow night, as once the party kicks off, nobody would notice a bit of disruption! Lauren thinks that the party they're planning must be huge. Lauren asks if she can attend, and Beth agrees. Lauren says that she was only joking, but Beth insists. The pair get dessert ready, and Cameron gazes at Lauren appreciatively. Lou catches him! LOU: (sternly) What are you looking at her like that for? CAMERON: I wasn't looking at her like anything. I'm just looking. Debbie is miserably watching television alone. Eventually, Julie comes in. Julie's surprised that Michael isn't back already, and then says that she's decided that they shouldn't confront him when he gets in. Julie says she needs the night to calm down, and they can talk to him in the morning. DEBBIE: Talk to him? What good's that going to do? JULIE: Maybe none, but I owe it to your dad to try. It's possible I can find out why Michael's been behaving this way. Work something out between us so we don't have to bring the police into it. DEBBIE: I don't see why you'd even want to, after everything he tried to do to you. I reckon he's psychotic or something. You don't know what he might do next. JULIE: Well, I won't be taking any risks. But I do intend to talk to him. Julie goes to bed. Debbie stays in the living room, and is glum. She hears Michael coming in and she turns the television off. DEBBIE: (shortly) If you mean Mum, she's gone to bed. MICHAEL: I'm surprised she even bothers to get up any more. ...I had a great dinner with Dad - he's with us! He can see putting Julie away is the only sensible option. DEBBIE: So why are you so keen to hurt Mum? MICHAEL: You don't think I'm enjoying it?! ...but sometimes we have to do things we don't like because...they're the *right* thing. DEBBIE: (determinedly) Yeah, Michael. That's kind of how I saw it in the end. Doug, Pam, Beth and Brad are having breakfast. Brad wonders where Bert is. Pam says that Bert's visiting a friend, and probably won't be back for the engagement party. Brad is annoyed - the main reason Bert came to visit the family was because Brad got engaged. He moans that if Doug had made Bert feel more welcome, Bert might have hung around. Doug grumbles about how it's nothing to do with him, just as there's a knock at the door. Gaby answers it as she passes - it's Wayne, who's after Doug. Doug says that he's about to go off to work, but Wayne can chat to him whilst he loads the ute. Wayne says he'll see everyone at the party. They both leave. PAM: I did. I mean, he is our neighbour! Just about everyone else in the street seemed to be going. GABY: (pointedly) Just about everybody else in the street's our friend! Pam winces as Gaby stalks off! Beth approaches Pam with a scarf and asks if she can borrow it. Pam says it's not hers, so it must be Gaby's. She reckons Gaby won't mind. Brad starts to say something about it, but Beth rushes off for work. Phoebe is unhappy that they can't afford to get Brad and Beth a decent engagement present. Stephen says that they can't afford to spend any money, so maybe they shouldn't go to the party altogether. Phoebe isn't impressed, and points out that Beth was their bridesmaid! Phoebe says that even if they didn't go, they'd still have to get them a present. STEPHEN: We've just got to think of a present that's not going to cost anything. Stephen says that they've got lots of photos of Brad and Beth, and Phoebe's handwriting is nice(!) so they can make them an album. He raves about the idea, and Phoebe admits that it would be a personal present. Doug and Beth are loading up the ute. Wayne is chatting to Doug about Bert, suggesting that Bert might die and it would be a shame for them not to patch things up whilst they have the opportunity. DOUG: The old codger'll outlive the lot of us. If he died tomorrow, it's nothing to me. Wayne says he can't believe what Doug's saying. Doug doesn't care - that's the way it is. Doug says he appreciates Wayne's good intentions, but tells him it's none of his business. Doug and Beth leave. Lou is quizzing Lauren about any potential boyfriends. Lauren says that there isn't anyone. Lou is unimpressed - he told Lauren all about his love life. Lauren points out that he didn't tell her...she found out! LOU: It's the same thing, isn't it? You know me like a book now. Don't you think you should extend the same courtesy to your old dad? Lauren says there's nothing to tell. She says it's been ages since she met a guy she's even been remotely interested in. LOU: Come on, speak to Daddy! LAUREN: Just a guy I met when I was riding on the beach a couple of days ago. He was really interesting. We just talked for a while. I didn't even ask him his name. Lou is intrigued but his mobile rings disturbing their conversation. It's the police with some information on his stolen car. Lou agrees to pop in to the station on his way to work. Lauren tells him not to keep them waiting, but Lou is keen to hear more. LOU: Now you tell me about this guy on the beach. LAUREN: Nothing to tell. I guess there was some sort chemistry there but neither of us did anything about it. I'll probably never see him again. Lauren kisses Lou goodbye. Lauren walks up the driveway. Lou reverses out of the drive, and Brad greets him. Brad doesn't look up towards Lauren, and Lauren has her back towards Brad so neither of them see each other! Debbie and Julie are confronting Michael. MICHAEL: *Me*?! I tried to make *you* look crazy?! Ha. This is great(!) And I always thought you had no imagination! JULIE: (annoyed) Don't make me look like an idiot, Michael! I know what's been going on! MICHAEL: (to Debbie) And you actually believe this garbage? DEBBIE: It all fits. I wish it didn't. That my own brother could do something this rotten! MICHAEL: I haven't done anything! There's a knock at the door. Julie sends Debbie to answer and tells her to send the visitor away. JULIE: (angrily) All right, young man - how about you start telling the truth?! MICHAEL: So I can take the blame because you're out of your tree?! No. Way. JULIE: There's nothing wrong with my sanity, Michael and you know that better than anyone. MICHAEL: (smugly) Save it for Dad - maybe he'll believe you. I don't think so! Julie falls silent as Debbie walks in with two police officers. They apologise for intruding and explain that they're following up a lead about Lou's stolen car. The police officer - Sgt Bowen - explains that he's aware that Julie has a watch which matches the description of the one left in the glovebox. Michael's face falls as he realises that he's been caught out. SGT BOWEN: And it was given to you by your stepson - Michael? Julie pauses for a long time, and then eventually nods. SGT BOWEN: (interrupting) Are you Michael Martin? SGT BOWEN: All right, son. I'd like you to come down to the station. I think you can help us with our enquiries about Mr Carpenter's stolen car. Debbie puts her arm around Julie, who is stunned. Michael looks gutted. Stephen is moaning that they don't have enough photos. Phoebe suggests that they only fill up the first few pages and leave the rest for Brad and Beth to add to over the rest of their lives. Stephen says that he's been trying to think of something to write, but he's drawing a blank. Phoebe rolls her eyes - it doesn't have to win the nobel prize for literature! Stephen grumbles that they shouldn't even bother - the whole engagement is only due to a stupid mistake. Phoebe wonders what he's talking about. Stephen tries several times to brush it off, but Phoebe insists that he explain. Debbie is sitting solemnly. Julie comes over to her and strokes her hair. Julie wonders how the police found out about the watch. Debbie doesn't answer the question, but thinks that the police coming was for the best as Michael didn't seem to appreciate Julie's efforts to give him a chance. Debbie is upset that Michael threw it back in Julie's face. Philip arrives home. He asks how Julie is, and she explains that she's been trying to call him. Gaby told her that Philip was at the doctors, but when she called Dr Dawson's surgery, he wasn't there. Philip explains that he's been to see someone who can talk to Julie about her "problems" - that's why he's home, as he's come to drive Julie over there. Julie tries to explain that she's not insane but Philip - kindly - shrugs off what she's saying, and says that she should meet the appointment to ease their minds. DEBBIE: There's nothing wrong with her, Dad! It was Michael. JULIE: I'm sorry, darling - I didn't want you to find out this way. But it was Michael. He's been trying to make it seem like I was going insane. PHILIP: (looking confused) What are you talking about? JULIE: And I'm afraid there's more I should tell you. Lauren is cleaning some riding equipment. Cameron is watching her work, and loudly sighs. Lauren stops what she's doing and turns to him, and Cameron hurriedly apologises and says he was daydreaming! Lauren says she was daydreaming too - worrying about Lou. She says she's never seen him look so down before, but Cameron is confident that he's ok.
Cameron pauses and then tells Lauren she needs to have some fun. He jumps at the opportunity to ask her out for a dinner date. Lauren thanks him but turns him down, explaining that her early hours at the stables mean that she doesn't go out at night. Cameron apologises and backs off, but it's clear he's very keen. Gaby and Pam are in the kitchen. Brad and Beth are at the table. Doug walks in and tells Brad off for leaving his shirts on the floor. Brad looks at the shirt that Doug threw at him, and explains that it's not his - it's Bert's! DOUG: It's bad enough having him in the house without him dumping stuff on the floor! Pam tells Doug that *she* told Bert to hang it over the back of the chair, and it must've fallen off. Pam points out that it's not a major drama! Doug thinks it is - it's his house and he's having to put up with someone he doesn't want living with them! PAM: Only for a couple more days. DOUG: A couple of days too long! Brad tells Doug to lighten up - there's a party brewing! Pam wonders what Brad will be wearing to the party. BRAD: (in singlet and shorts) What I'm wearing. PAM AND BETH: (dismayed) Awwwww! BETH: You'd better be joking! Brad argues that Beth's dressed casually (she's in her builders overalls!) and Beth tells him that she's planning to get changed! Brad thinks he should turn up the way he is. BRAD: If people think we can't afford lots of clothes, they'll feel guilty and get us expensive wedding presents! PAM AND BETH: (rolling their eyes) GO! Brad goes off to get changed, grumbling about what married life is going to be like. Doug yells after him to get used to it! Pam hopes that Beth can do something with Brad! Doug goes over to Beth and they talk about the wedding finances. Doug and Pam explain that they don't expect Bunny to foot a huge bill for the wedding, as it's too much for one person to take on, but at the same time, Brad's their first child to get married and they want it to be special. Doug says they have an idea, and he wants to run it past Beth. Philip is astounded when he learns what Michael's been up to. PHILIP: Other kids go through family break ups and they deal with it! Julie thinks that Michael was just very close to Loretta and couldn't get over her death. DEBBIE: He really hated you. He even convinced me that there might be a reason to! But I never thought that he'd try and kill you. JULIE: (unnerved) That's putting it a bit strongly, Deb. DEBBIE: Is it?! He left you to drown in the spa the other day! Philip is annoyed with himself for not seeing what was happening. He explains that when Michael told him that he'd accepted Julie, he readily believed it because he wanted it to be true. Julie says that pointing fingers will do no good. JULIE: We have to do what we can to help the boy. PHILIP: If I was you, I don't think I'd care. JULIE: Whatever he's done, Michael is a part of our family. Somehow, we have to help each other through this and I guess that means helping him too. He trails off. Julie looks at him sharply, enquiringly. Philip decides better! He says they can talk about it later, and says he ought to go to the police station. He asks Debbie to stay with Julie. Debbie apologises, but Philip tells her it wasn't her fault. He reckons things will be ok. He kisses Julie and leaves, saying he won't be longer than he can help. Cameron and Gaby are blowing up balloons. Beth goes to get changed. As she passes Lauren, Lauren comments on her pretty scarf. Beth says that she borrowed it from Gaby. Lauren says that she used to have one that was exactly the same! Phoebe and Stephen arrive early, as Helen's taken Hope. Phoebe and Stephen give Beth their present - it's a salad bowl! They explain that they had something else planned but it fell through. Beth is stoked...apparently she needed a salad bowl(!) Everyone grumbles about where Brad is, and Stephen says that he saw him across the street. Lauren announces that she needs to get to work at the stables. Cameron thought she'd be in for the party, and Lauren says she'll be back in a couple of hours. She leaves, just as Brad walks in! Phoebe pulls Beth over to one side. PHOEBE: There's just something I think you should know about Brad. BETH: (mock horror) Don't tell me he's already married! BETH: This is the happiest day of my life - no bad news allowed. Phoebe shrugs and says that she wanted to tell Beth that she thought Brad was a great guy! Beth grins and agrees! The party is in full swing. They open a present from Wayne - it's a Scrabble game, but Gaby has already bought them one! Gaby points out that her gift is the deluxe version, and Wayne snipes at her for drawing their attention to it! Gaby leaves the group. Phoebe and Stephen disagree over telling Beth that Brad's proposal was a misunderstanding. Phoebe thinks they'll feel really guilty if the marriage is a disaster! Stephen thinks it'll be fine, and it's none of their business! Brad spots Lauren! They're both surprised - they say that they're both the last people they expected to see at the party. Brad starts to wonder who she knows at the party, but before Lauren can answer, Doug swoops in and drags Brad off. Doug excitedly tells Brad about a mate of his who has a function centre. The place is booked up months in advance, but they've had a cancellation and it's been offered to Doug at a knock down rate. Doug explains that Bunny can't afford anywhere anyway, and he says that he and Pam will pay for the centre as their wedding gift if Beth and Brad take over the booking. Brad is unsure, as he and Beth wanted a quiet wedding but Doug says he's already spoken to her and she thinks it's a great idea. Doug says that they have to decide now - the booking is for 3 months time. Brad is stunned - he thinks it's too much of a rush. Doug wonders how long he was planning to be engaged, and Brad is stumped. He weakly agrees, but Doug tells him to think about it. Brad looks nervous. Julie is wondering about food, but figures that none of them will feel like dinner. Julie suggests that Debbie go over to the engagement party, but Debbie isn't in the mood. JULIE: Thanks for taking my part in all this, Deb. After all, Michael is your brother. Julie puts her arms around Debbie. JULIE: I know I'm your stepmother, but I do love you. Debbie hugs Julie back tightly. DEBBIE: You've been terrific. You were the one who came and told us when Mum died. You stood by us and made sure we had everything we needed when Dad was in hospital. JULIE: I s'pose. I just wish I'd tried harder to make contact with Michael. DEBBIE: I thought I had a good relationship with him. But it didn't help. He's got something wrong with his personality. I love him, but you just can't behave like that. Debbie looks pained. Julie hugs her. Wayne tries to talk to Brad about the paintball game. Brad says it isn't his thing. Wayne wonders how Brad can know that if he's never tried it. Brad changes the subject and asks if Wayne's seen the girl who's about 5ft 2 with blonde hair. WAYNE: Yeah, she must've got her looks from her mum, huh? Wayne tells Brad that Lauren went into the back garden. Brad hurries off. He passes through the kitchen where Pam is taking a photo of Gaby and Beth hugging. Debbie and Julie are sitting glumly in silence. Philip and Michael arrive home and Michael stalks into the living room. PHILIP: (coldly) He's been charged over the car stealing. They've put him in our custody for the meantime. There's something we're going to have to discuss. PHILIP: Frankly, I don't think I want him here. JULIE: (shocked) Philip, he's got nowhere else to go! We'll have to manage. Philip stands between Michael and Julie. PHILIP: (angrily) You watch your mouth! 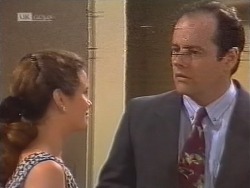 Michael maintains his eye contact with Julie over Philip's shoulder, but Philip blocks his way to Julie. MICHAEL: I bet you really enjoyed putting me into the cops. You've been waiting for years for a chance like that! DEBBIE: Mum didn't put you in. MICHAEL: -DON'T *EVER* kid yourself you know her better than I do! Michael puts his eye contact back to Julie. MICHAEL: (threateningly) YOU put me in. And someday, I'm going to make you SORRY! Debbie gets up and approaches him. DEBBIE: (upset) She *didn't*. It was me. I didn't want to. I'm your sister and I love you but...someone had to stop you. MICHAEL: I thought you were the ONE person I could trust. SISTER. Well, forget that! From now on, you mean NOTHING to me! You're just one more of THEM! Michael angrily gestures towards Philip and Julie. Debbie is very upset. Michael storms past them all and Philip follows him. Julie approaches Debbie and they hold each other. Brad and Lauren are by the pool. Brad tells her he never thought he'd see her again - he was starting to think he'd fallen asleep on the beach and dreamt it! Lauren says it was a bit like that...but it was a nice dream. Brad can't believe she's Lou's daughter and asks if she'll be staying in Erinsborough. Lauren says it seems an interesting enough place for the moment. Brad is pleased. Lauren says that if they're at the party alone, Brad should take the opportunity to introduce her to all of his friends. LAUREN: I haven't even met Beth's fiance yet! On cue, Beth comes outside and puts her arm around Brad. She tells him to come and help her - Pam's gone crazy with the camera! BETH: (to Lauren) So, I see you've already met my man! LAUREN: (to Brad) You're Brad, then? Beth drags Brad off. Lauren is gutted.